This is an election year, which is exciting in and of itself! 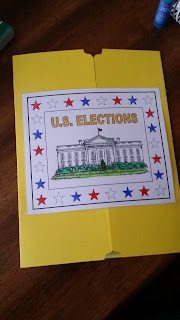 The candidates, the ads (okay, not so much the ads), but the whole process by which the American people pick their next President of The United States is exciting! This year is the first year I can really say I have been glued to the television nightly to keep up with all of it. That's why I was so happy to see that HISTORY Through the Ages Hands-on History Lap-Pak: U.S. 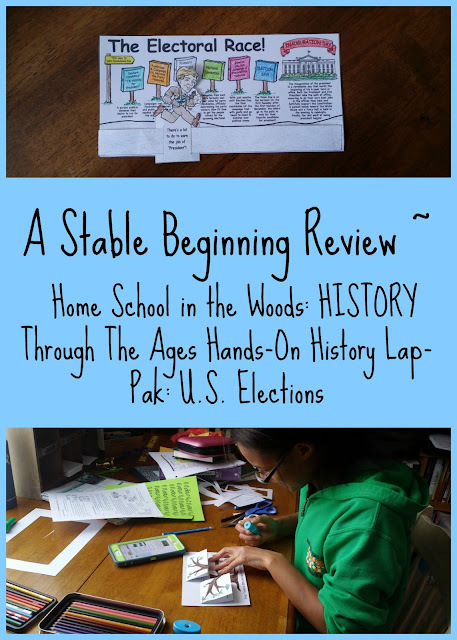 Elections from Home School in the Woods was being offered for review during the height of all the preliminary election process! 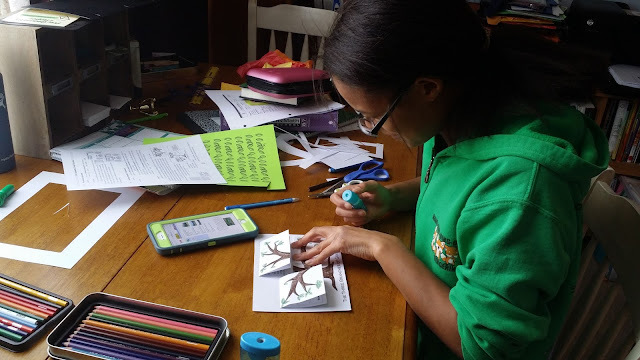 Our family is no stranger to the Home School in the Woods company. I tell you it was love at first sight when I happened upon their booth at my local homeschool convention in 2011. I hit the jackpot that day with this company and it has transformed our way of schooling ever since. This U.S. 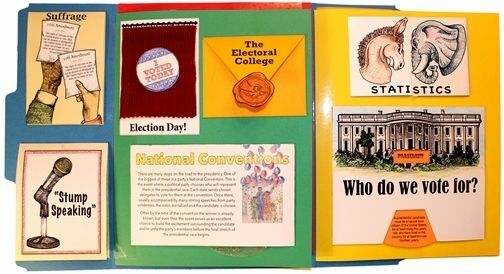 Elections Lap-Pak is just as fabulous as the other products Home School in the Woods has to offer. However, don't think for a minute that this Lap-Pak is a cookie cutter, run of the mill Lap Book, because it is not! With this project your child will cover an array of topics including the different forms of Government, Caucuses & Primaries, the differences between the Parties, and the Electoral College. 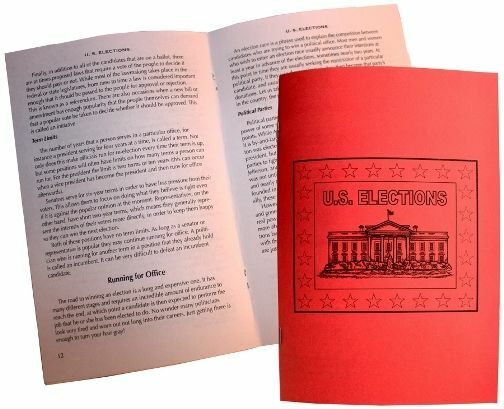 This Lap-Pak is more than just a Lap Book it is a hands-on History lesson all about the U.S. Election process. It can serve as a complete history unit study since it includes 21 exciting, hands-on projects to complete. 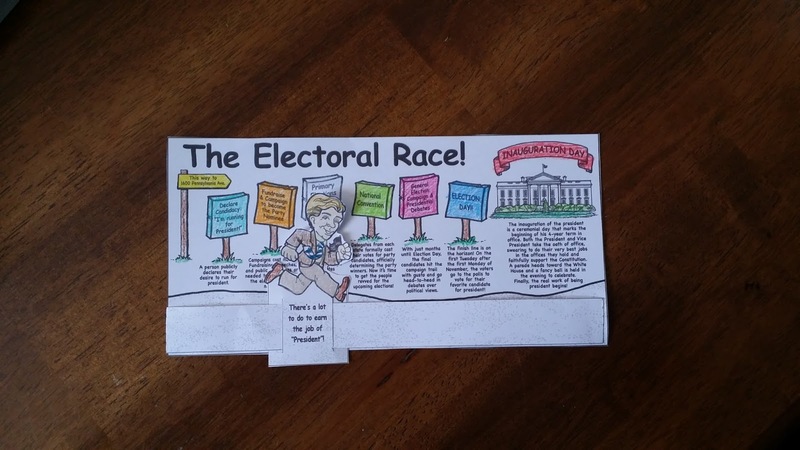 Through coloring, researching, drawing & writing, and gluing your child or yourself, will take a journey through the elections process of The United States discovering all of the details of what it takes to be President of this great nation. 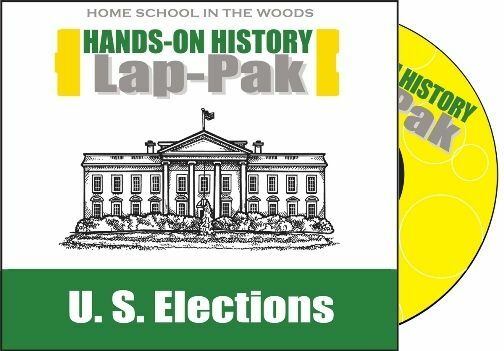 This History Lap-Pak is available either by instant PDF download for $18.95 or on CD for $19.95. Minimal prep work is needed on the teacher part as everything is contained in PDF files. I like to print the directions out and put them in a binder or three prong folder, whatever I have handy. The notes are clear and precise and easy enough for an older child to follow, if need be. I originally intended to use this with all of my school age daughters, making adjustments for learning levels as needed, however, I soon realized that the info was a bit too in depth for my younger two daughters, Kindergarten and third grade. The activities were spot on, but presenting the info to them for their understanding would take more planning on my part. Unfortunately, because it is travel season right now, I just don’t have the “extra” time needed to do that right now. SO, I plan to revisit this with them again come September when I can have it tailored to them a little more. I also plan to have my current 7th grader go through the Lap-Pak come September. Right now, her schedule is jammed packed and adding one more thing to her learning schedule is just not feasible. Now, don’t get me wrong, the LCDR and I stress academics and school over sports any day of the week, but we know this child and she can’t handle any extra right now. So, that leaves me with one school age daughter left at home, Madison, my current 9th grader. She has already studied American History but has yet to do any in-depth study of Government or Civics. Because I wanted to give her an overview of the election process and brush up on my own knowledge we are witnessing, we worked together on the Lap-Pak. Madison’s reading level is at mid- college level, so she was able to read and comprehend the material without much problem. We have been going at it slowly though, taking on 1-2 projects a week when we are in town on the weekends. We have not yet completed the entire Lap-Pak but it is great bonding time, coloring and discussing what we read and then watching or listening to the debates and town halls. Once she is done with her Lap-Pak I know it will be a special memento to look back on when she does take the Government/Civics classes in a few years. She will have a better understanding of what is involved to become President of the United States. If you have hands-on learners, I wholeheartedly recommend you check out this Lap-Pak or anything else that Home School in the Woods offers. 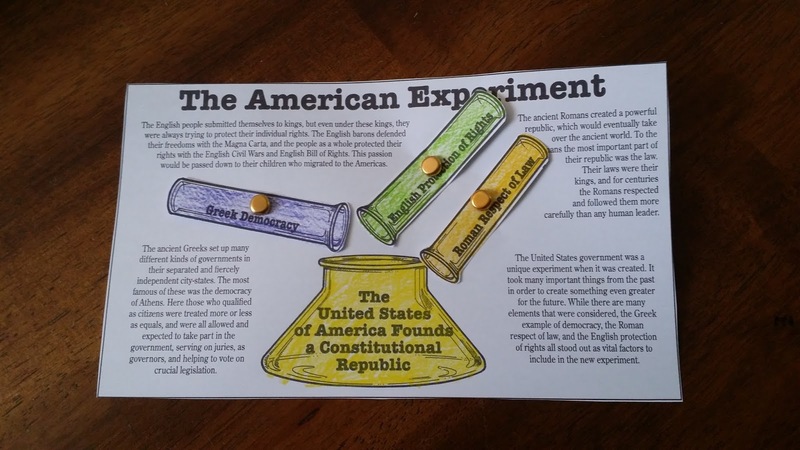 They have many great products that we use for hands-on learning along with our regular History curriculum. HISTORY Through the Ages Hands-on History Lap-Pak: U.S. 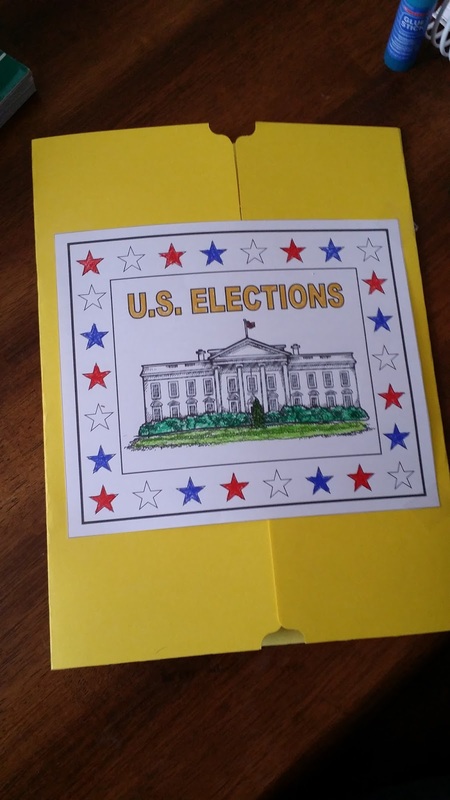 Elections is a fantastic way to bring History to life! Be sure to check out what my CrewMates thought of this product by clicking the banner below.